On Thursday, April 18, 2013 at 5:00 am, a weary group of travelers arrived at Tao Yuan Airport in Taipei 台北桃園機場, Taiwan. 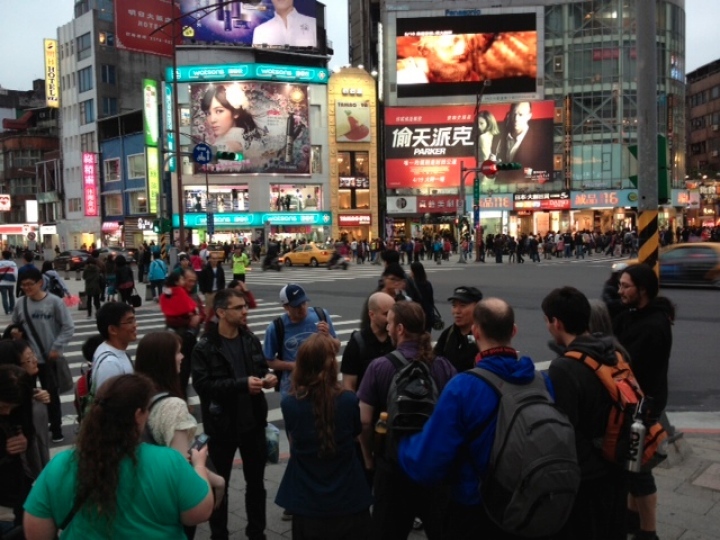 After exchanging currency and renting emergency cell phones, we met our tour bus and headed to our hotel. Thank goodness we had Sifu and Jia-her with us to speak with the bus driver. The entrance to our hotel was a curious little black door with a phone outside, nestled between a dress shop and a steamed dumpling restaurant. I don’t know if we’d have ever found it! The dumplings, by the way, were extremely tasty and inexpensive (about .25 a piece). An awesome deal we took advantage of many times. During a short rest period, a small band of Kung Fu friends took a walk around our new neighborhood of Shi Lin 士林, and discovered a neat coffee shop “Ikari” where we sat and relaxed and had some lunch. We met Kevin & Violet and Jin & his family who all came in from Australia outside the hotel at 3:30. Kevin was ready with Pizza Hut in hand. At 4:00, Alvaro came in from Norway and Sifu and Jia-her came back from their place. 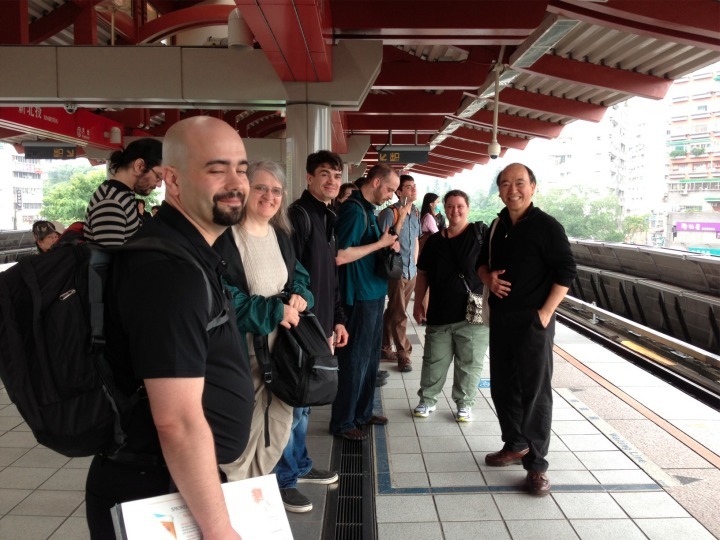 We all gathered and walked down the block to the train station, where we got our “Yo Yo” cards 悠遊卡 and hopped on the train to Xin Beitou 新北投. At Xin Beitou, we saw the park where we would meet every morning to practice, then took a nice walk up the hill to Jia-her’s favorite vegetarian restaurant for dinner. It was great! The waitress even walked next door to get Kevin a Coke, as they didn’t serve it there. After dinner, we took the train to Taipei Main Station, where we found Master Adam Hsu 徐紀老師, at his practice session in the Taipei City Fairground 台北市府廣場. There were a lot of introductions, and the presentation of our gifts. 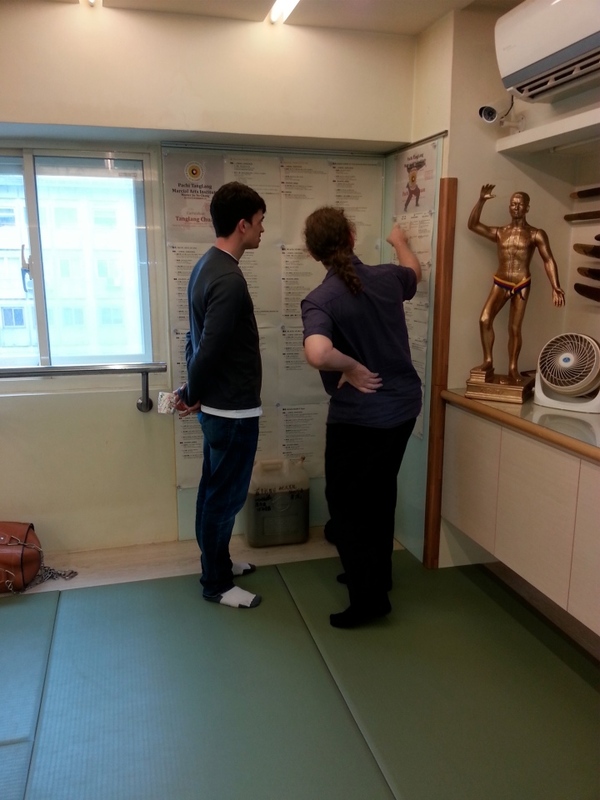 We spent the next hour exchanging Kung Fu demonstrations. It was really eye opening to see all of the different variations of forms we are familiar with. So cool! We couldn’t wait to see what else would be presented when we met again on Saturday. Around 10:45 we arrived back at the hotel for a well deserved rest, while Nick and Peter went to the airport to pick up Krystal, who flew a different route. 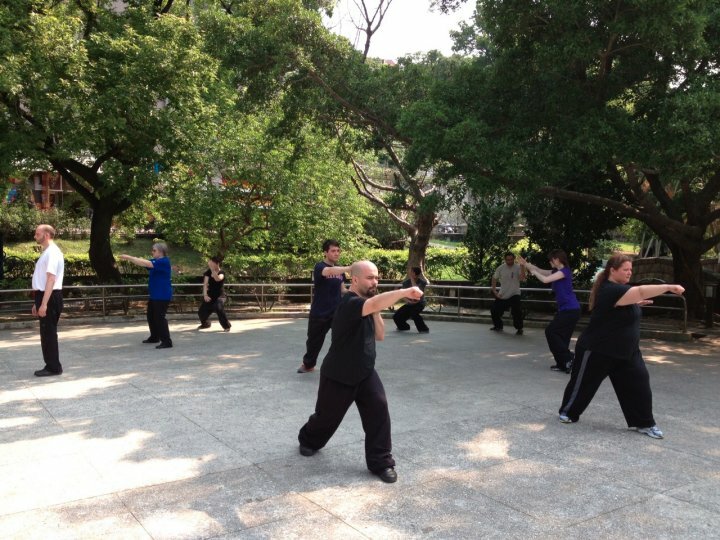 On Friday, April 19, 2013 at 7:30am, we all met at Xin Beitou Park 新北投公園 to practice and prepare our forms for the upcoming demos at Master Adam Hsu’s. 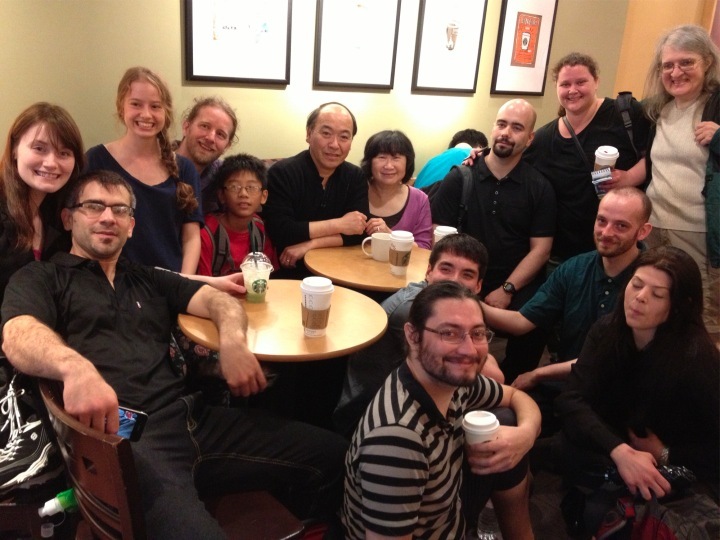 After practice, we all invaded the local Starbucks for coffee and breakfast. Later in the week, the manager of Starbucks actually asked Sifu which days we would be coming in, as she wanted to overstock the shelves, since we were apparently buying her out of food! After breakfast, we headed to Master Su’s studio in Da’an 大安站. It was an absolutely amazing day. 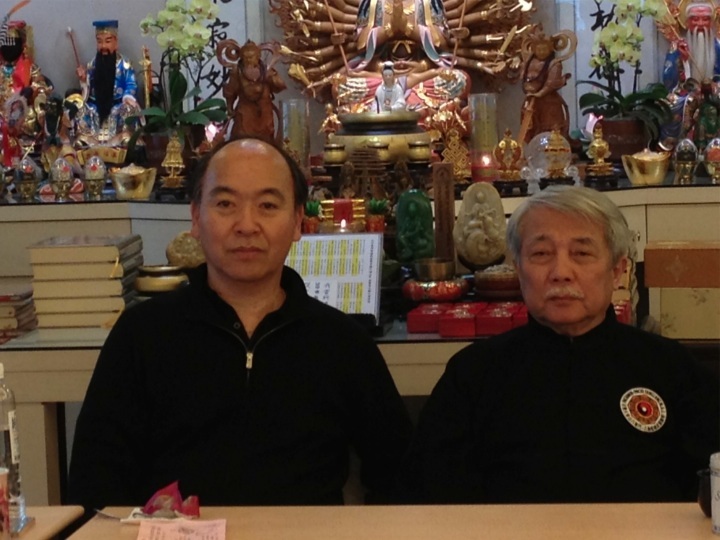 We met Master Su 蘇昱彰老師 at his studio around 10:00 am. He held a question and answer period until lunch, when we were served a traditional Taiwanese lunch box. 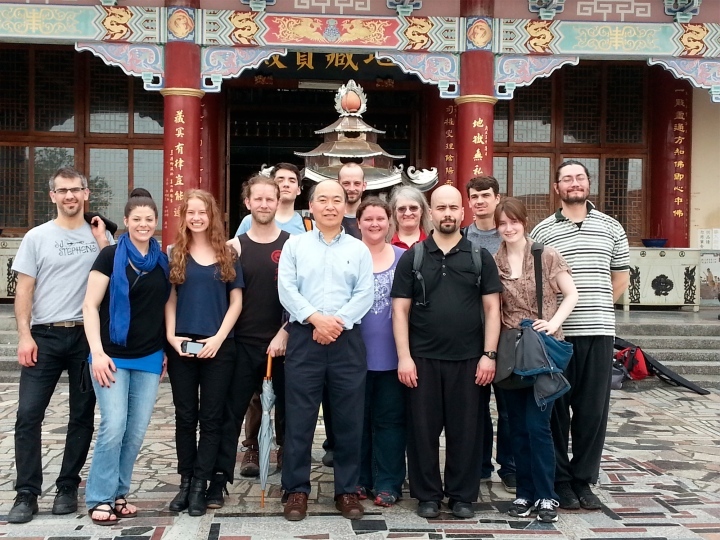 Master Su’s students were exceptionally gracious in hosting our group. During lunch, Master Su presented all of us with a “Golden Lady” 準提佛母 medallion. He showed us his wall that listed all of the systems, weapons, and forms that he has learned. We practiced for a little while, and then sat for more Q&A, as well as some very interesting stories. 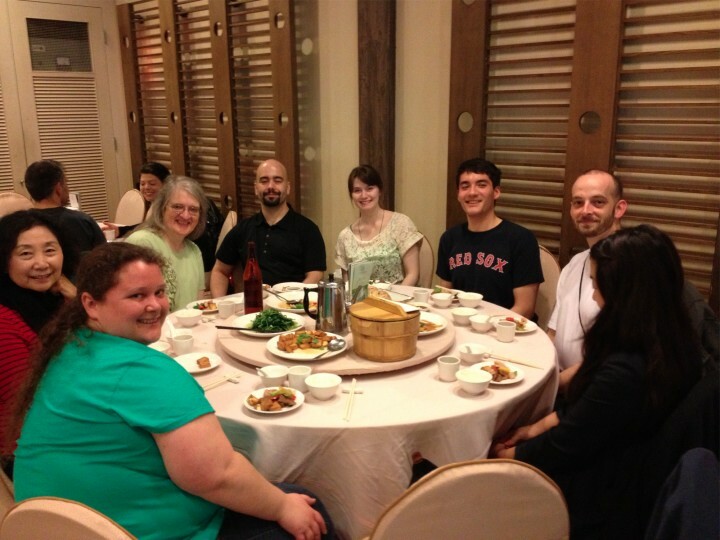 Later, we all went down the street to have dinner at a restaurant of Master Su’s choosing. We got to sample so many different dishes. What an experience! We had Lion’s head soup, Shanghai soup, Stinky tofu (Yuck!!!) tempura fried whole fish, sesame balls and many others. Violet was one of the troopers who ate the whole fish, including the fried jaws and teeth. I had it myself, it was pretty good. Peter, who became known as the “cleaner upper”, volunteered to help us finish any dish that the table couldn’t. 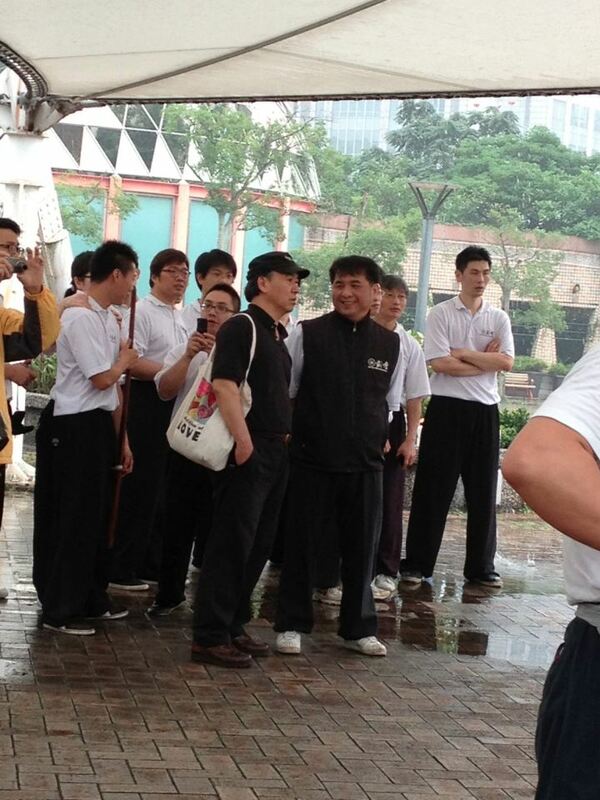 Saturday, April 20, 2013 at 6:30 am we met for practice at Xin Beitou Park 新北投公園. We all worked on the forms we would share that afternoon at Adam Hsu’s until about 8:45. Another trip to Starbucks and we were off to Taipei Main station and the park. 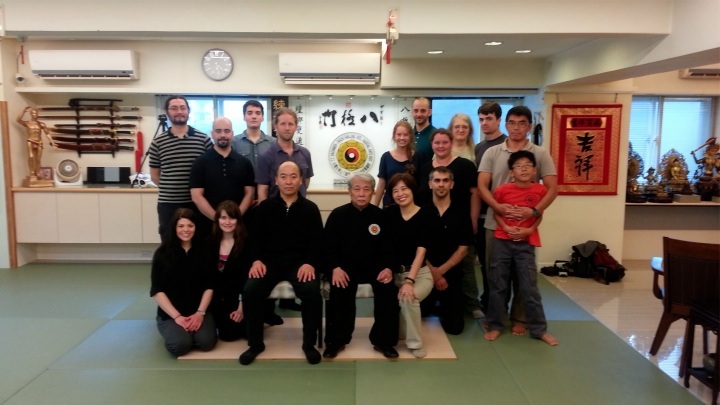 We were met by Master Adam Hsu 徐紀老師 and his students, Master Su 蘇昱彰老師 and students, Master Lin 林仲曦老師, Master Xi 希家駿老師 and Master Jin 金立言老師. We traded forms for about 2.5 hours. Again, totally amazing! 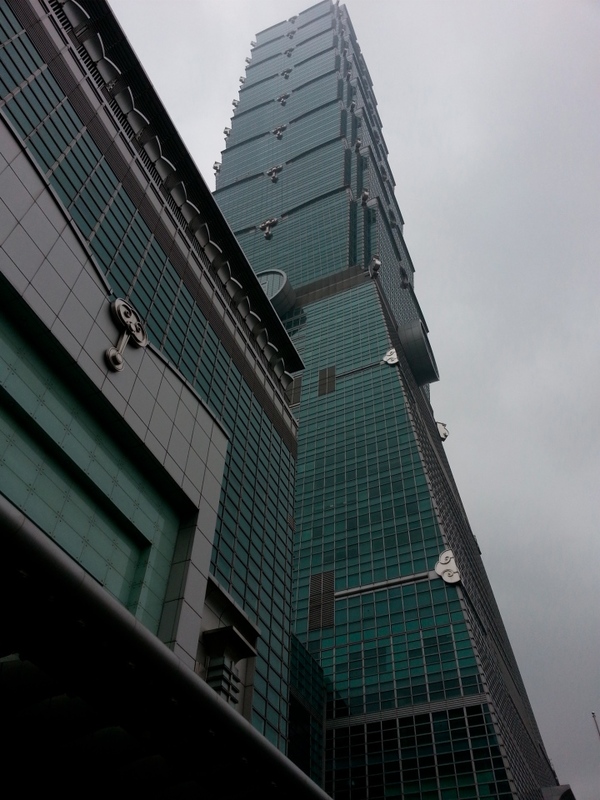 Next, we walked to the mall at Taipei 101 (台北101). We stopped first for lunch in the basement which was a sea of different restaurants. The volume of people there was crazy! It was a zoo, but a well organized zoo. A couple of us tried to go up in the tower to see the counter weight that allows the building to shift without breaking during seismic activity. I guess, due to terrorism concerns, visitors aren’t allowed. 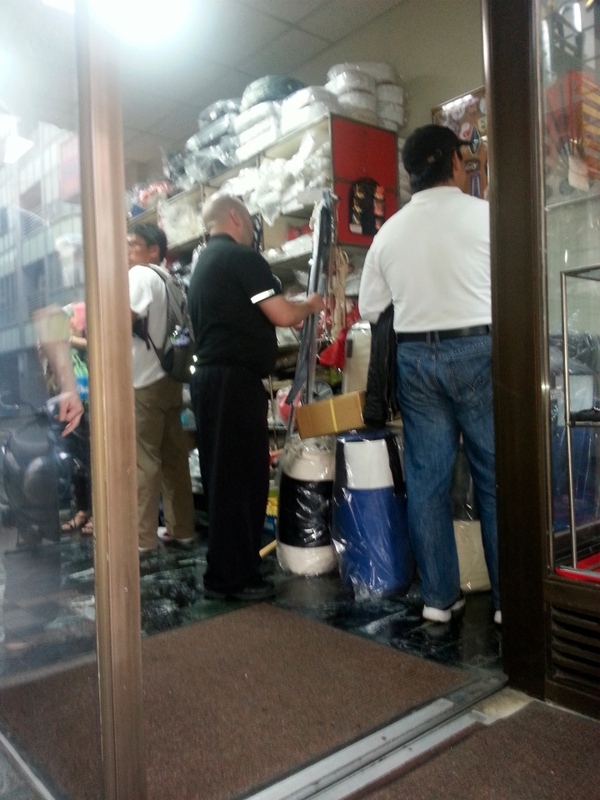 Next, we took the train to Chang Kai Shek station and walked through town to the Da Jong 大眾武道用具 Martial Arts supply store and went crazy buying pants and shirts and weapons. It looked like everyone was drunk on Kung Fu!! We picked up the Miao Dao’s 苗刀for the school as well. We left Sifu and Jia-her at that point, so he could visit family. The rest of the group headed back to the hotel to get ready for the Night Market. The Shi Lin Night Market 士林夜市, what a great time! Alley after alley in downtown Shi Lin, full of vendors. We all tried some food we’ve never tried. Some things on a stick that I can’t identify, tasted really good though! A very inviting pastry shop met us at the end. We picked up a variety of treats for Violet’s birthday the next day. Sunday, April 21, 2013 (Violet’s birthday 17! ), we met Sifu at Shilin Metro station 士林捷運站 and took a train to meet the only outgoing bus to Da Ban Gern 大板根 and the Hot Springs Resort. There, the general manager greeted us and gave a presentation about the history of the hot springs. You wouldn’t believe the difference in ppm of oxygen in the air in that area, compared to in the city. Something like a thousand times. Sifu’s brother and sister in law met us there. 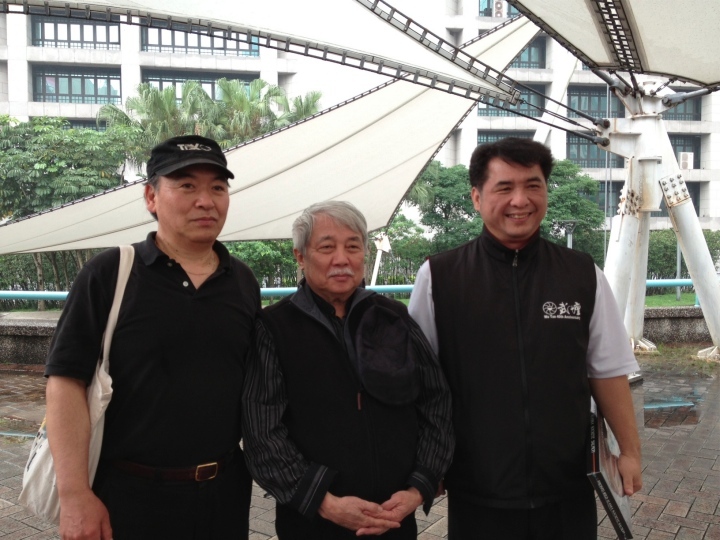 His brother in law was a geophysicist under President Ma. He took us on a hike up the mountain and explained the groundwater/oxygen contents, and why the plants and trees grew the way they did there. He then treated our group to lunch at the SPA. After lunch, the group enjoyed an afternoon at the spa. There were hot, warm, cold SPAs, massaging, pressurized, and stagnant spas as well as mineral or herbal baths. 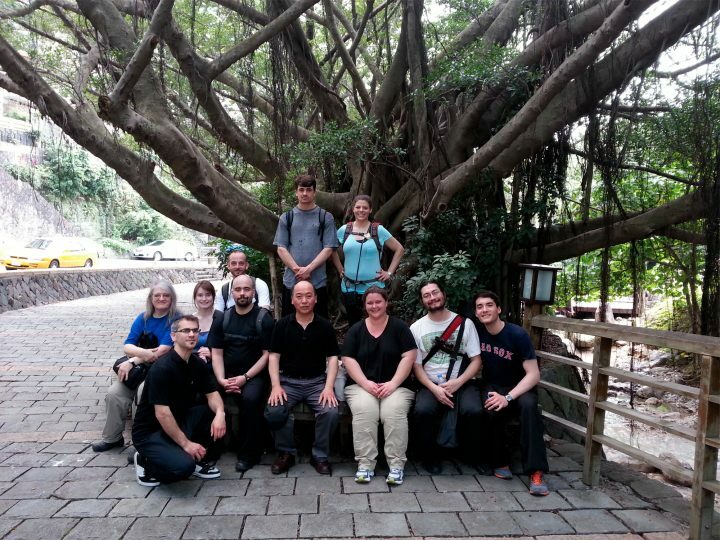 When we were all refreshed, we took the bus back to Ximen 萬華西門 to explore Sifu’s home town. We took a walking tour of where he grew up and played and went to school. We even got to see the home he lived in. His elementary school was the size of an entire city block, and at the time when he attended, they served over 10 thousand children. 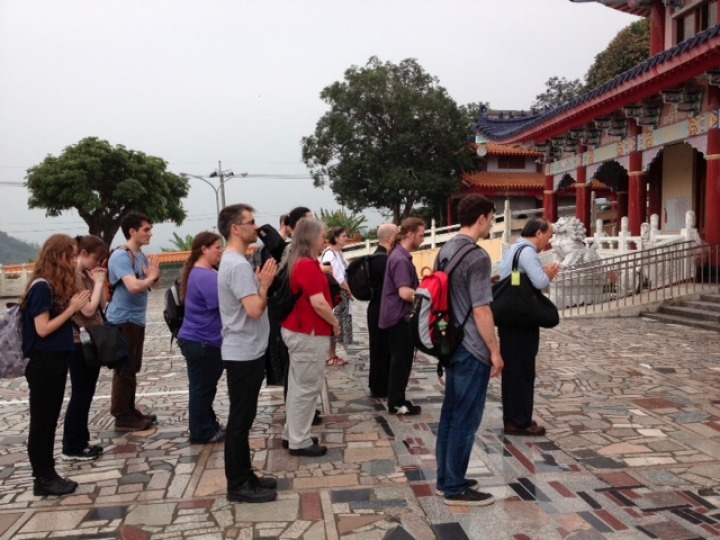 Afterwards, we went to Langshan temple 龍山寺 where Sifu and all of us paid our respects to the “Lady of Compassion” 觀音菩薩. Sifu visited this temple often with his grandmother. 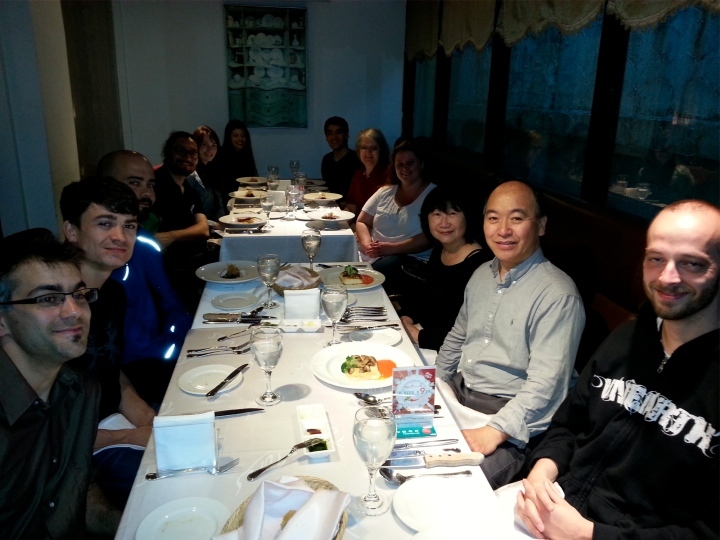 We had dinner at different locations in smaller groups that night and Jin and his family departed back to Australia. 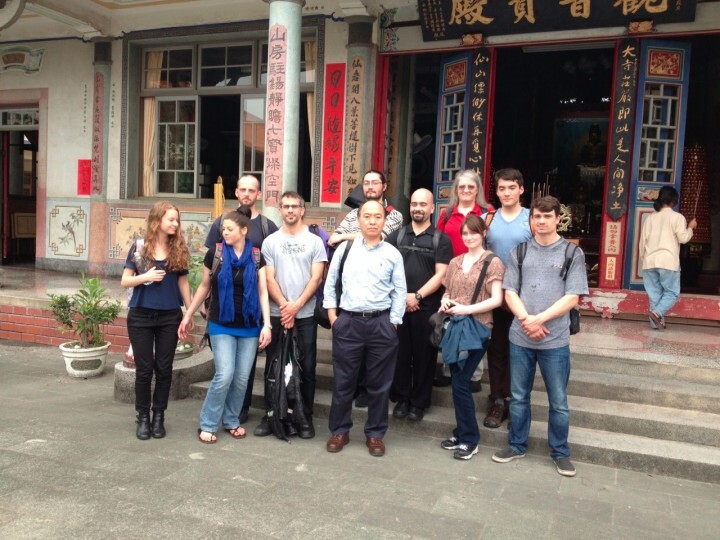 Monday, April 22, 2013 at 6:50 am, we all met in front of our hotel and took a nice tour bus to Tainan 台南, to visit the Great Immortal Temple 大仙寺where Sifu attended Master Su’s intensive summer camps for Kung Fu. Master Bai, a spiritual master met us there and gave us a tour of the main grounds. 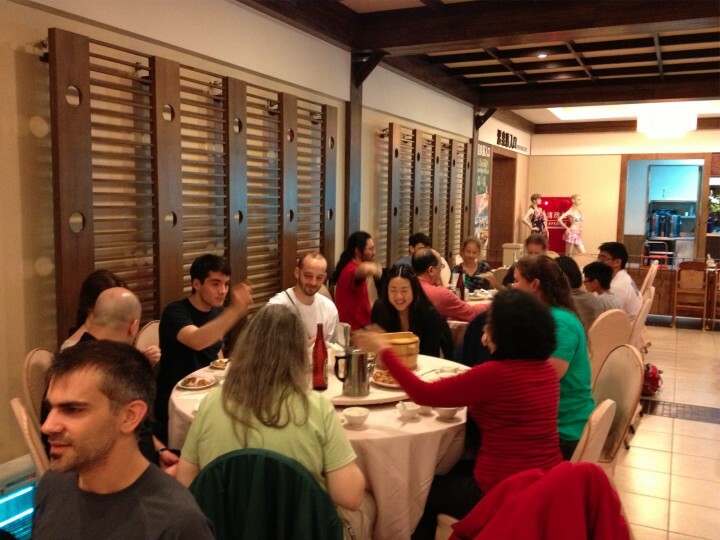 We then joined the monks and nuns of the temple for a nice vegetarian lunch. Afterward, we cleared our tables and scraped our plates for the nuns. 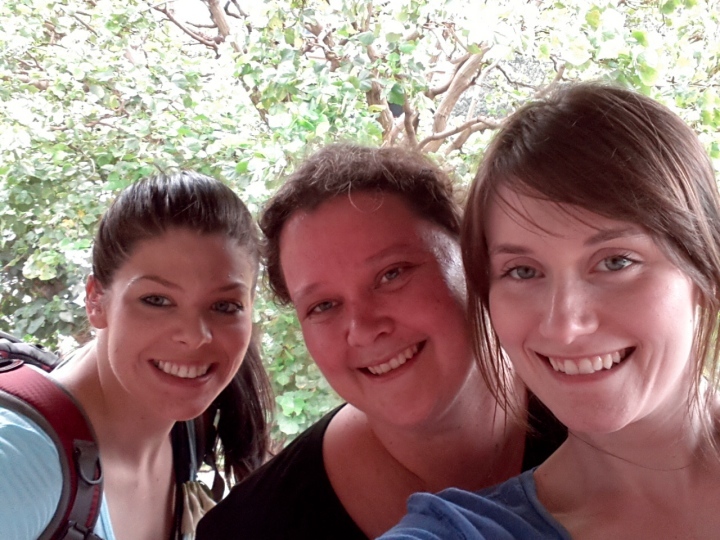 After lunch, we had a free hour to explore the grounds and practice at the temple. 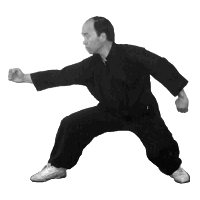 A few of the group were instructed by Master Bai to practice particular styles in specific places that brought out the best energy for them. That was pretty cool. Next, we toured the grounds with Sifu and saw the area where his summer camp was held and the place where all of the students boarded. 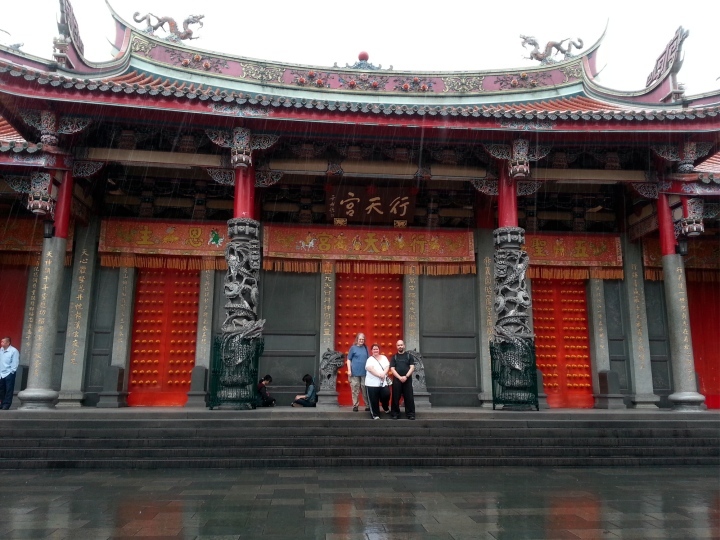 Sifu thanked the deity of this temple for bringing us all back there to see. He hadn’t been there in 40 years! On our way back to Shi Lin, we stopped at a street “Seng Ken Old Road” 深坑老街 well known for its “Stinky Tofu” 臭豆腐. I think every vendor, on both sides of the road had their own version. It was a shopping extravaganza and another time to try more local delicacies. 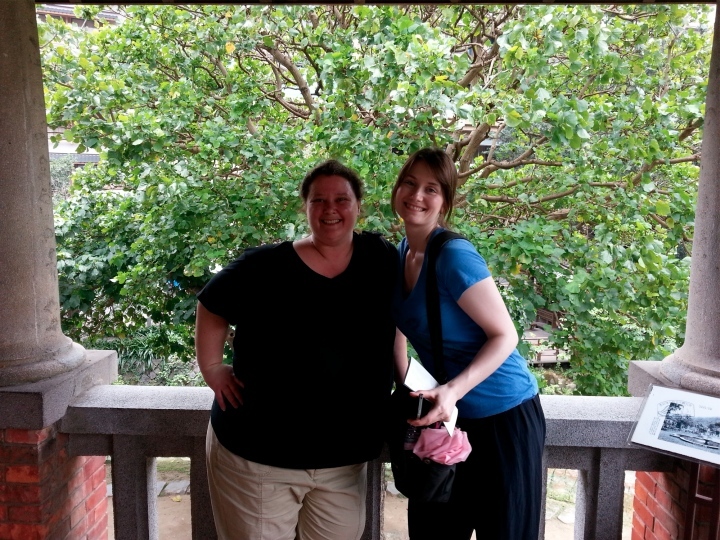 Jeanette, a coworker of Sifu’s joined us for this trip. We headed back to the hotel and said our “Good bye’s” to Kevin and Violet as they were heading back to Australia in the morning. 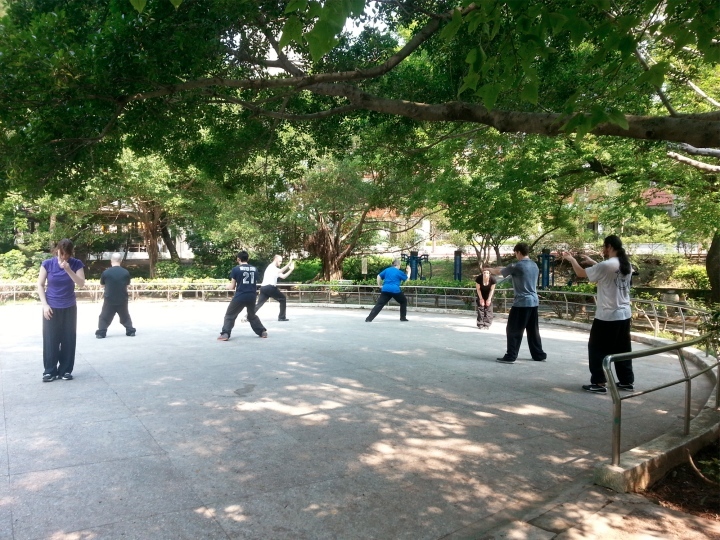 Tuesday, April 23, 2013 we met early at Xin Beitou park 新北投公園 for practice. 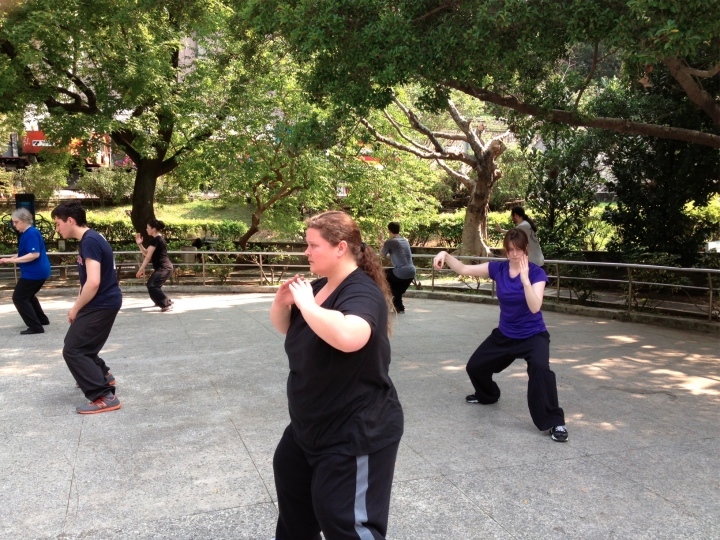 After visiting GIT 大仙寺, practice was a lot different. We slowed it down to “get it in our bones.” I believe everyone made great discoveries about their own form. I know I did. After practice, and coffee of course, we to a walk around Xin Beitou 新北投 (Jia Her’s hometown) to visit some historical sites. 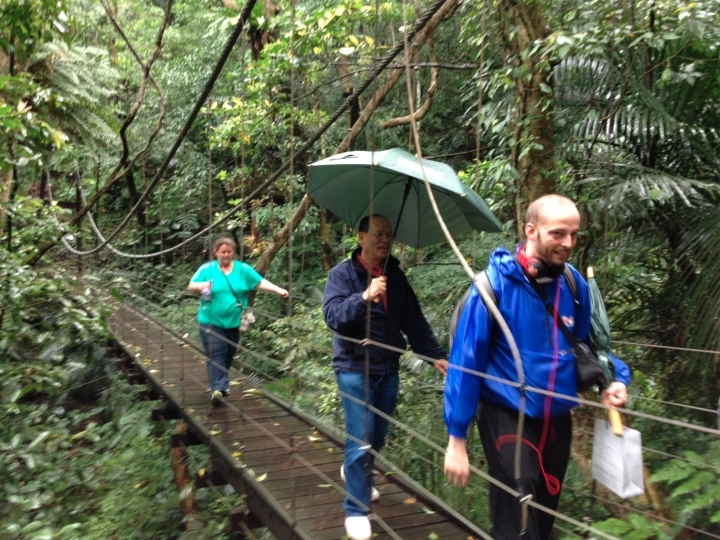 We visited the world’s “greenest” library. 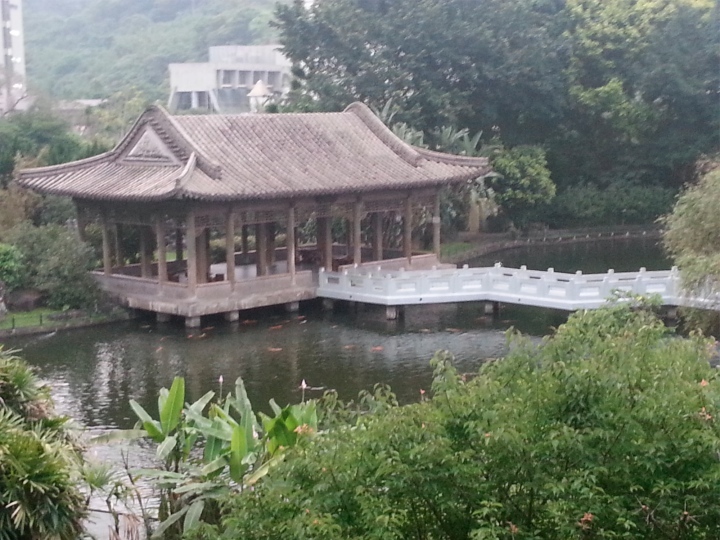 Then we walked a little further up the hill to visit Xin Beitou Hot springs museum 新北投溫泉博物館 (a class 3 antiquity). Jia Her would swim there as a child. 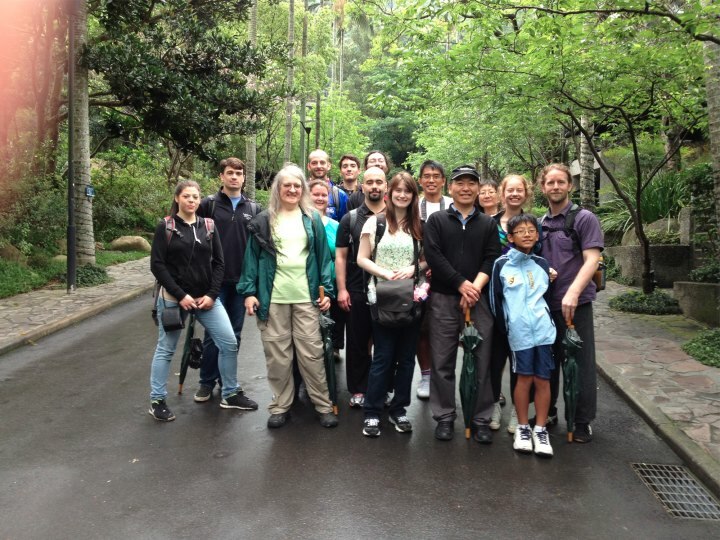 We watched a video there, chronicling the history of the hot springs and took a self tour afterward. Next, a little further up the hill, we stopped and visited a famous calligrapher’s home which was on the grounds of the new Xin Beitou hot springs. By the way, $1.50 a day for the hot springs what a deal! One more of the many things our group took full advantage of. 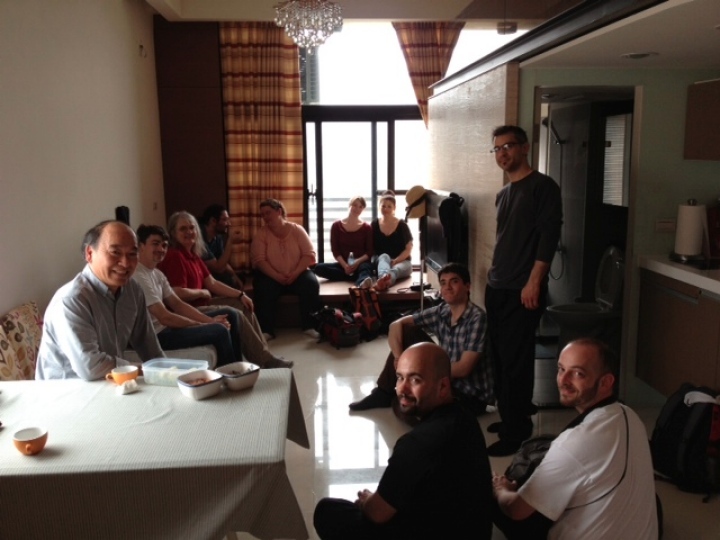 At the very top of the hill, we were treated to a lunch of Ramien & Lamien. The bbq pork lamien was delicious. 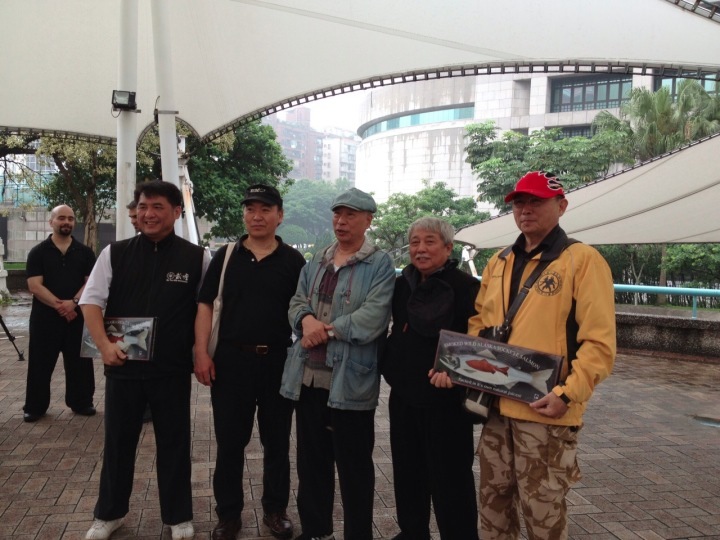 Next, we caught the #230 bus to Yan Ming Shan park 陽明公園 . We hiked there for about an hour. 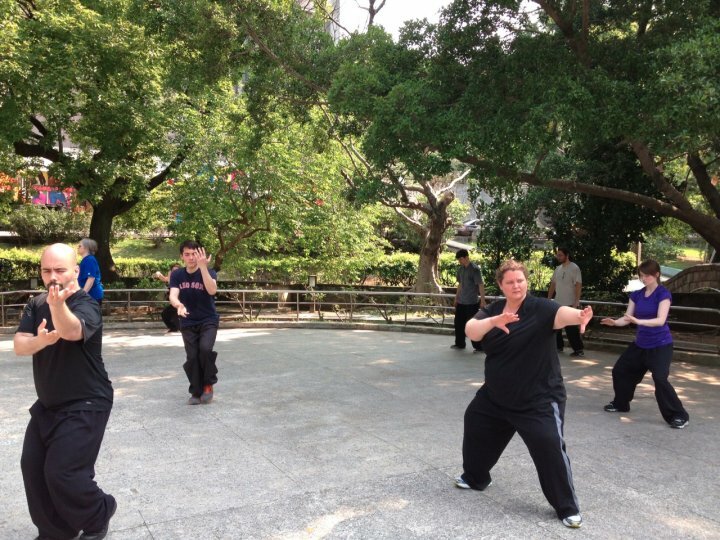 Peter actually got to practice Qi Xing on top of Qi Xing mountain 七星山, totally awesome. 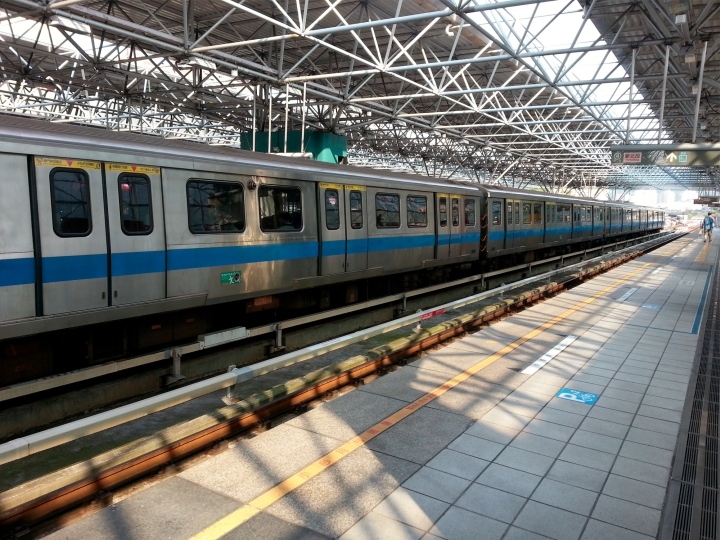 We quickly caught one of the buses back to Shi Lin and went to Taipei main station to attend one more of Adam Hsu’s classes. 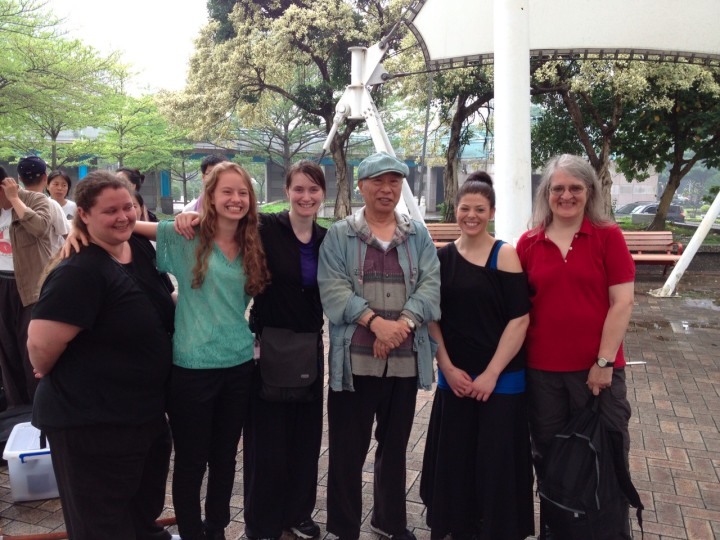 We learned his version of Tan Tui and a version on Tai Chi and Xiao Baji. 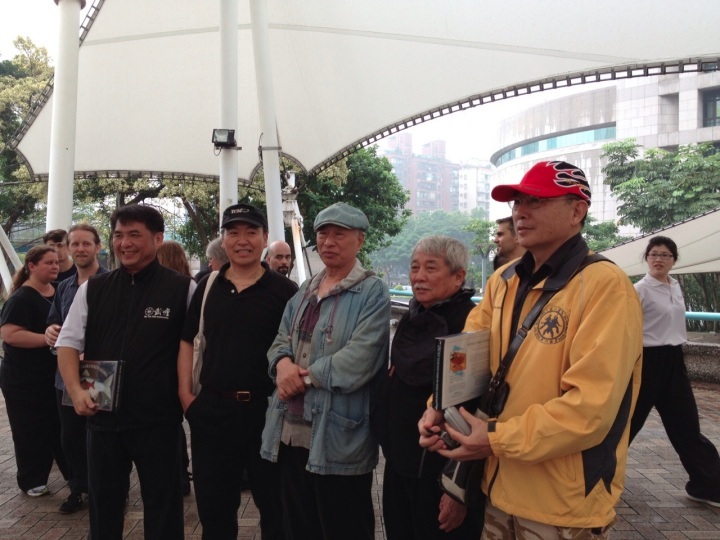 Wednesday, April 24, 2013 we met early for practice at Xin Beitou. Afterwards, coffee and breakfast of course. Then we walked up the hill and visited Sifu’s place where he gave us his own question and answer period. That was totally cool! Later in the afternoon, we visited the National Palace Museum in Shi Lin. We saw so many amazing artifacts. The grounds were beautiful as well. We split up for a free night. Alvaro & I checked out a nice restaurant in hopes it would do for a group dinner the following night. Peter desperately searched for a golf course. Jacob and Elisabeth got some sleep. 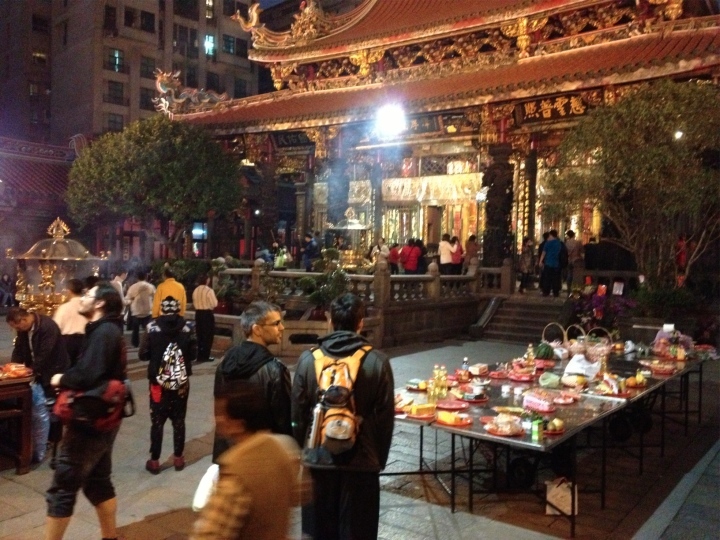 Nick, Krystal and Monica went on an adventure to Jilung 基隆 for a different night market experience. This one was located right on the water, so the seafood was very fresh. 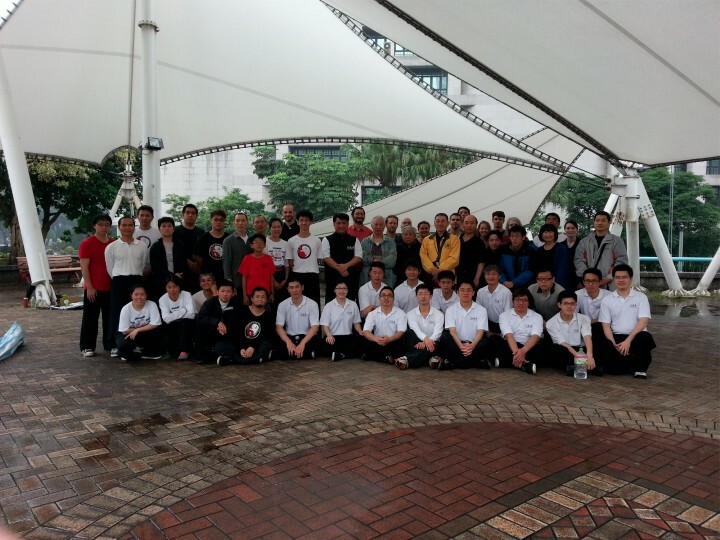 Thursday, April 25, 2013 at 6:30 am we met one last time at Xin Beitou park for practice. And then, coffee….. We tried a purple rice wrap from the vegetarian shop-totally yummy. Then it was time to pack. 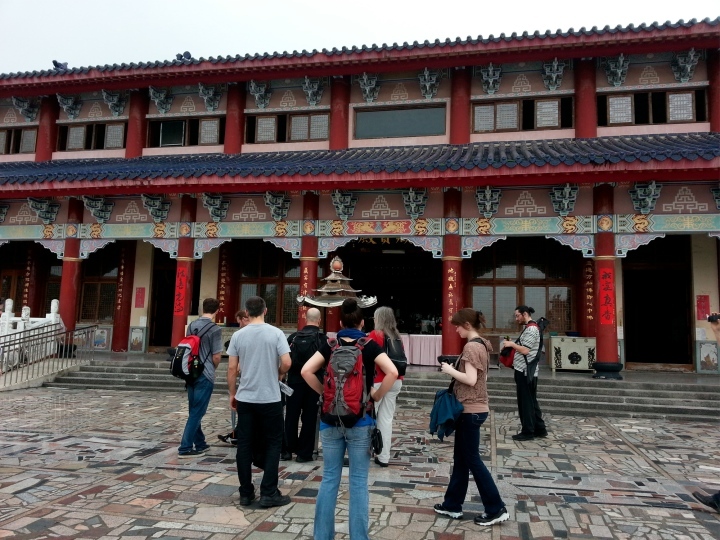 A couple of us went to Xiantien Temple 行天宮 and then back to Taipei City Hall mall to try a last few treats. They made some really great pastries. After we got back to the hotel, we made reservations at “Toro’s” for a farewell dinner and finished packing. Dinner was great. We had a great time sharing some experiences and spending time with the group. Friday, April 26, 2013. Depart back to Anchorage or on to Australia. After a misadventure of packing on the part of a couple girls, everyone was on their way. I’ll always treasure the experiences and memories of this trip. I saw so many beautiful things and tried so many different foods, also learned so much about Sifu’s and our Kung Fu history. I saw a country where the citizens were so proud of where they lived. Everything was well organized and litter and graffiti free. Everyone was respectful of one another. Heck, they even number and catalogue the maple trees so that they can be cared for and preserved properly.